In the Mahabharata, the most ancient epic of the world, we read a prize question that was asked to difference great men of ancient times. “What is the most wonderful thing in the world?” Various people came up with answers but only Yudhishthira’s answer was finally accepted. His answer was this: “Everyday and day after day, animals and human beings are passing out of life, but we do not think of death. What can be more wonderful than this?” The answer still holds true after thirty five centuries have passed since it was given. We do not think of death, although we see every day the dead bodies carried to the grave. I have always been fascinated by the arcane and the unknown. 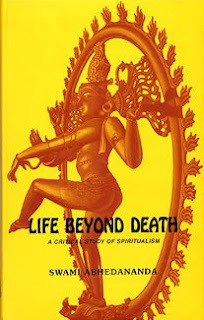 Hence this winter when I had nothing significant to do, I tried to find a logical explanation to what lay beyond the grave through Swami Abhedananda’s book Life beyond Death: A critical study of Spiritualism. For the uninitiated, Swami Abhedananda was a colleague of Swami Vivekananda and the founder of the Vedanta Society and former president of the American Psychical Research Society. I could not stop. I had to read on. The author first analyses the belief of the materialists who firmly deny the existence of the soul after the death of the body. They believe that the body is the soul and the soul does not exist outside of the body, and when the body dies, the soul is also dead and gone. The author raises the question that if we assume that the soul or the mass of intelligence is caused by the body then what is the cause of that body? The materialists would probably answer this question by saying that the body was caused due to the body of its parents. However, this answer is rejected by the author as instead of explaining the cause of the matter, we are shown another combination of matter which is like explaining the cause by the effect as the body of the parents is the effect of their parents. Furthermore, the author analyses the argument of the materialists that thought, intelligence, consciousness is nothing but a function of brain. He counters and I quote: “after dissecting a human brain when one does not find there any trace of the soul or mind, and denies its existence, or asserts that mind or soul is the function of the brain, he forgets that such knowledge necessarily implies the existence of his mind or soul. Hence, it will be absurd to deny the priority of that which is basis of consciousness and intelligence.” He also adds that if it be a scientific truth that motion produces motion, how can we maintain that the molecular motion of the brain-cells produces consciousness or intelligence, which is not the same as motion, but is a knower of motion? Hence the author concludes that the source of consciousness cannot be found in matter, but stands independent of it as the soul of the body. I am yet to find counter of his argument. The above description is summarised from the first chapter of the book titled: Does the soul exist after death? The author goes on to say that each soul is eternal and after death it retains its individuality and takes with it all the experiences, impressions and ideas which it gained on earth. The arguments for these are covered in successive chapters of the book which deal with rebirth of the soul, reincarnation and immortality. The beauty of the book lies in the fact that its pages do not narrate ghost or supernatural stories to prove its views which is usually expected from such books. Instead, the book agrees that 99% of such recounted incidents are fake and for the purpose of making money. The author logically tries to justify his views with brilliance. For those interested, the book is published by Ramkrishna Vedanta Math, Kolkata and is priced at Rs. 80. "The author goes on to say that each soul is eternal and after death it retains its individuality and takes with it all the experiences, impressions and ideas which it gained on earth." If it is so then where is all that experience gone? why cant i use my experiences/ideas of my past life today? And if it cant be used then what is use of that experience? I am not trying to contradict the author. I myself believe in soul. Just this question arose in my mind after reading your blog. @Corpse on Road: Good question. The answer to your question lies in the fact that memory is not part of the soul. We know that memory is part of the brain and is related to matter. (We can now artificially create memory too) Hence we cannot directly use our past experiences. I am guessing (as I am yet to read the whole book) that maybe sometimes when we know how to deal with a certain situation even we are facing it for the first time, it may be because sub consciously we are using are past experiences. Of course you are using your past life experiences. Otherwise, how did you become good in math in this life? That is because you learned it or created it as your foundation (karma) in the past life. Memory is not in the brain. Memory is in the soul. Brian is just a tool that the soul uses to do its job. Reincarnation proves that the memory from the past life is with you in this life. That means you can talk about things of your past life in the present life. This proves that the memory cannot be in the brain; for it cannot come from the brain of the previous person to your brain now. You can get some solid proof of reincarnation from the works of Professor Ian Stevenson (1918-2007). He has shown that not only the memory, but the physical wounds also appear in the next life. In one of his examples, he found a person who died with gunshot wounds on the chest. The boy in the next incarnation has the same wound at the same place of the body. The chest wound is a smaller mark whereas the back wound, from where the bullet came out, is larger. Stevenson verified this from the post mortem record of the previous person. He has hit the perfect point to prove reincarnation. We do not have to rely on memory only now. Birth marks are a new proof. I always feel that there is a certain dis-connectivity in this whole concept of soul, reincarnation. I am not saying I am dead-against the idea of the separation of body and soul but see if you can help me here. A "century" old soul with all the "mortal" experiences lives the body and gets rebirth as a child. But in history none of the world leaders, greatest poets or scientists in was a child but a grown-up person. Why does it take certain amount of time(age) to get enough maturity, learning from mortal experiences and not by inheriting something from the past life to do something to change the world. If a soul is "matured" and "experience" enough, then such a soul in a child-body can start a much needed revolution just after "re"-birth. @Cherubic Child. I have tried to answer similar question asked by Corpse on the Road above. So basically, restating that: The answer to your question lies in the fact that memory is not part of the soul. We know that memory is part of the brain and is related to matter. (We can now artificially create memory too) Hence we cannot directly use our past experiences. I am guessing (as I am yet to read the whole book) that maybe sometimes when we know how to deal with a certain situation even we are facing it for the first time, it may be because sub consciously we are using impressions of our past experiences. Well.. the other Devdeep is everything the real counterpart is not. In fact he is almost the opposite. For he is witty, talkative and has a dry and sarcastic sense of humour. Also he considers the computer programming as a total waste of time, Chaos Theory a joke and a mortal sin to play Prince of Persia or NFS to kill time.